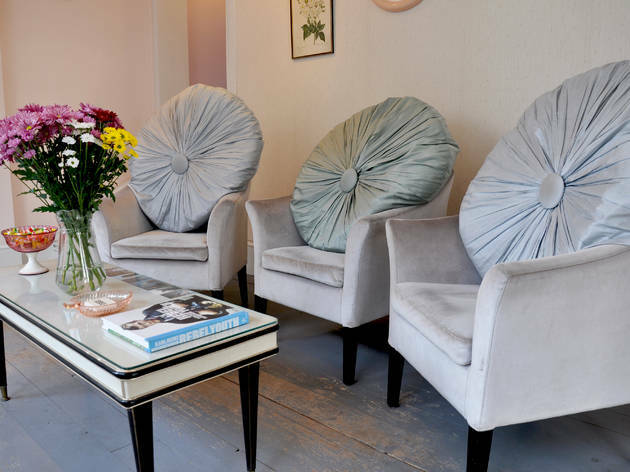 Picture-perfect balayage, Instagram-worthy waves, and barnets every shade of the rainbow; That’s what you can expect from Foster London, a cutsie, laid-back salon that’s just a stone’s throw from Shoreditch Overground (they’ve got another over in Dalston, too). 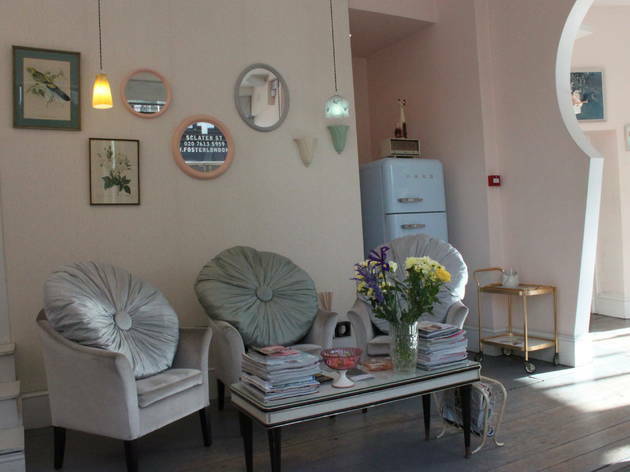 Run by siblings Drew and Nadia Foster, the salon strikes the perfect balance between trendy and twee. Inside it’s all pastels, bleached wood, retro artwork and cat ornaments. Sadly no actual felines, but I’m told there’s often a friendly pooch or two to greet you in reception. 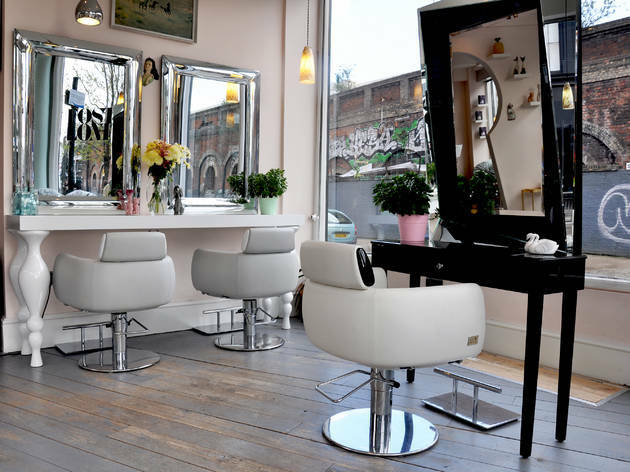 There are bright cutting stations and a mosaic basin area downstairs, while on ground level the salon looks out over Boxpark. It’s a sun trap, ideal for a spot of people watching, just as long as you don’t mind passersby peering back at you with your foils in. Foster London doesn’t just look good though, the team are creative, knowledgeable and attentive. They don’t rush (even when you’re running over your appointment time late on a Friday night) and they constantly check to make sure you’re happy with your hair’s progress. You can trust them to take you to some really wacky places, but if you’re after subtle, you’re not going to walk out the door with a do you’re uncomfortable with either. I was a hair-dye virgin when I first stepped foot inside Fosters and after some gentle guidance from one of the colour experts was persuaded to go for something different. The end result was a bouncy, biscuity balayage that suited my skin tone and face shape much better than what I’d originally asked for. Hair heaven. 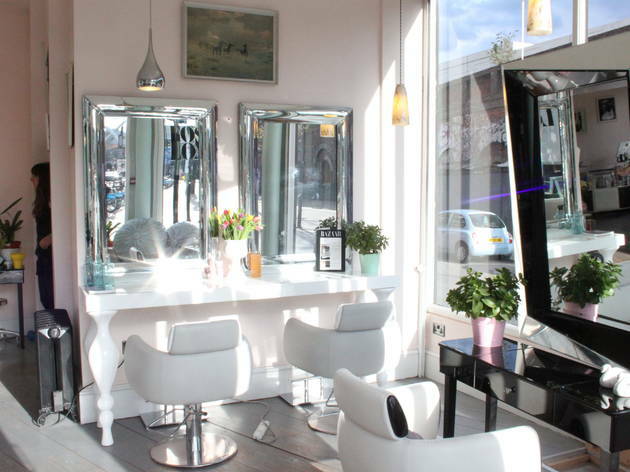 The Shoreditch hair salon is renowned for being a colour specialist salon hosting a team of blonde specialist's and colour experts whom specialise in the latest hair colour trends and techniques including Balayage, Ombre, Sun Kissed hair, Sombre, Platinum Blonde and Pastel hair tones to Classic Highlights, Babylights and Ecaille. 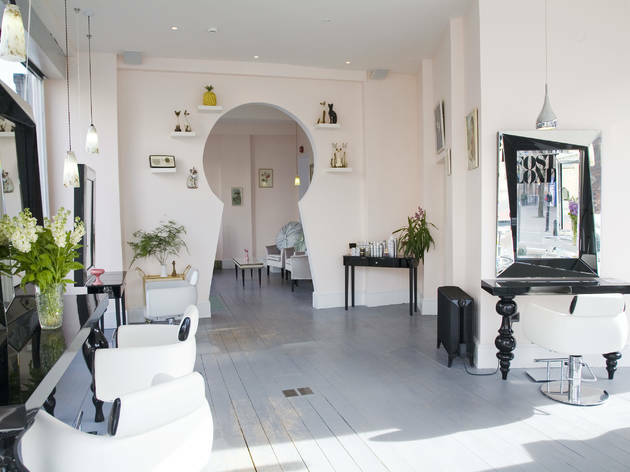 Foster London are not only colour specialist's but also talented hair stylists creating classic hair to modern and wearable styles, tailored and created to suit your face shape and features. 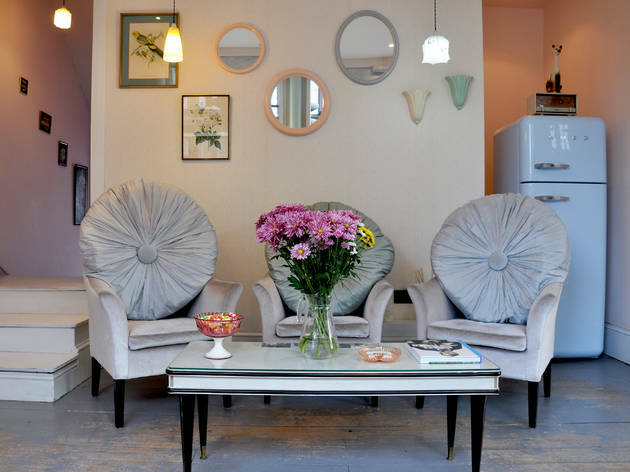 The friendly and accomplished team are based in a 1960’s inspired, pastel haven with a relaxed atmosphere in the heart of Shoreditch. 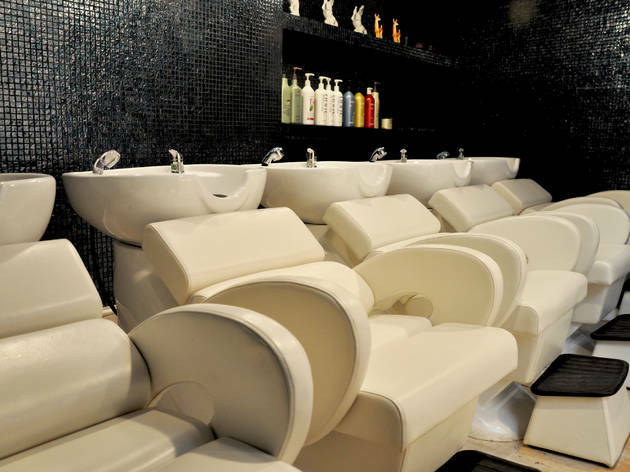 From the oversized cushions in the lounge to having your hair is washed in 60’s style lounge chairs where the cushioned headrest relieves the pressure on your neck unlike any other basin. The difference is incredible and a much more enjoyable experience. No corner of client comfort has been overlooked. Welcome to Foster London. I used to go to the salon quite a lot and was really happy with my stylist. I had been visiting Simon my stylist for a quite a while as he has been able to give me the colour I like. One day when I went I was told that he has left to go travelling by one of the managers, so I of course chose another person within the salon. The new hair dresser really ruined my hair with bleach which I didn't ask for and was not what I usually got. My hair was beyond repair and I am still waiting for my hair to regrow back to its healthy state. Now upon this happening to my surprise a few weeks after this happened, when I was walking down the street I bumped into my usual stylist from this salon and he had said he had not been travelling but left for another salon, which makes me think that the people at this salon do not care for their customers and only for the money since I paid more than I usually would. I want a more personal approach to hair dressing and feel that I don't get it here. Attended this salon after seeing industrial heavy weight logos on their site, had a toner applied in a previous salon which left my hair two tones lighter than I wished. I take my appearance importantly, the quote of £219 fix this with a soft natural brunette with sun kissed natural ends was cool for a colour specialist salon in my local area. First appointment resulted in bleached yellow hair with purple lilac streaks past my eyes an extra dye was put on I was told to attend so they could ‘finish it off’ when they had more time. This cost £165. My hair started to break off. Asked to be booked in to finish this off saw a strange array of black stark streaks In between the prior yellow colouring, charged £183 this time with further hair detroriation. My hair prior to foster was strong and healthy. Both my colleagues and friends have commented on how poor my hair looks, it’s unprofessional, cheap and perishing. I understand mistakes happen, having just received an email from salon manager Ben blaming me for the deterioration off my hair and refusal to refund is a horrible insult to injury. This has been a terrible ordeal I wouldn’t wish to befall on anyone who takes pride in their appearance, expects a professional service and a business with integrity. See attached photos. They speak for themselves. Cute and authentic atmosphere. Great location for East London. The staff was very friendly from the moment I booked to the moment I left the salon feeling amazed with my new coloured hair. Lachlan, a lovely hairdresser, transformed me and my hair from a light brunette to a redhead. We talked a bit to find out the exact shade of red that I wanted and would suit me. He was very attentive and positive. My hair came out exactly how I wanted and I received tons of compliments. I am very happy to have discovered a favorite hairdresser and salon in London. I will definitely be going back. If you've ever wanted to truly be treated like a VIP while getting your new hairstyle, Foster is the only destination you need to consider. As a typical guy who's only spent £10 or so per haircut, to go up several levels in service and ability is truly an experience. They serve beer and G&T as standard! My stylist Katie was great fun and did a wonderful job with hair and beard. The whole place is very well put together, well done Drew and the team! 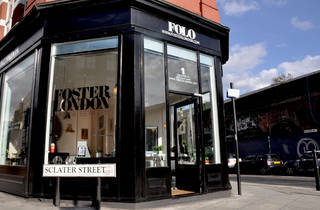 I have to say Foster London is the absolute best, every hairdresser and colourist I have had has been absolutely great. They treat you always very well and professionally and the results are always incredible. They always listen to what you need and never cut too much or too little, always what is asked for and the colours are always on point. I consider myself a very fussy person but I have never had one complaint. Thanks so much FOLO! I'd like to thank Foster London, especially to Lachlan, for the colour and the short cut. I found the atmosphere warm, professional and down-to-earth. I enjoyed a good cup of espresso and fresh, delicious marshmallows. The stylist was attentive and careful, more importantly very good. So the experience ended up absolutely how I would imagine it. Looking forward to coming back! I couldn't agree more with Leanne H's review - and I couldn't be happier with my experiences at FoLo! The staff are lovely, the haircut is the best I've ever had, and it's such a great atmosphere. Long story short, I am so scared of hairdressers as many have gone too short and not listened or just weren't that great so I looked around for somewhere that was highly rated and close to home. I found Foster London and after reading reviews I decided to book in and was excited to do so! Had such a good feeling about them. The salon had such a lovely vibe, I'm not very confident but strangely I felt at ease and very comfortable. The staff were so friendly and genuine (Not pretending to be interested in what you're saying whilst wearing a fake smile!). They have a drinks menu and when your drink arrives you even get a little treat which is so cute and such a great touch, really nice! Lauren was beyond amazing, such a lovely lady and she listened to everything I had to say! I can honestly say that I had the best haircut I've ever had! Normally hairdresses blowdry my hair straight which ends up being so flat it's horrible! But Lauren finished my hair in lovely soft waves which I'd always seen and loved on others, I felt great, my hair looked amazing and she hardly took anything off as we'd discussed so I still have a lot of length which I am so happy about! The long layers are so minimal that they've added life to my hair without being a bit much like my previous layers! Really happy to have found someone who can cut curly hair, sounds so simple but it really isn't. Alexander cut my hair into a beautifully natural shape and made my curls look like they were stolen from an angel. So happy with my shiny new hair. Just wanted to say a big thank you. I had the best ever experience at Foster London. Hannah was utterly brilliant, she listened to me and was so patient. A big thing for me. She also helped me understand how to use my ghd's a bit more skilfully to do my own mermaid waves which was really helpful. Overall, speaking as a slight salon phobic, I felt relaxed and happy, the natural light pouring in through the windows, the tea and treat, the cold water with lemon were all lovely. I appreciated the laid back charm and ease of it all, which emanates both from the surroundings and the people - Stuart, the manager is gentleness personified, with a beautiful face and lovely manners. I am happy that I now have somewhere that I actually like going to rather than slightly dread! The surrounding area, Brick Lane, Columbia Rd etc is an added bonus. Love Foster London. I have been a customer from pretty much the beginning and have had my hair done by 4 different stylists so far, all doing a great job. I would like to see better stuff retention as I like developing a relationship with me stylists before I fully trust them, but I don't know the industry in and outs. Overall, extremely happy! 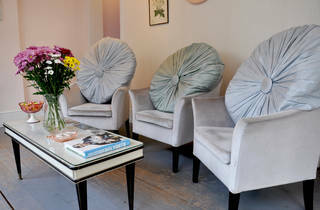 I'd been looking for a new salon for a while and having found Foster London online and then seen the reviews it seemed like the perfect place to go. I can't recommend Foster London enough - great relaxed salon, lovely people and brilliant service. Simon coloured and Claire cut my hair - both understood what I wanted straight away and did an excellant job. I'm really pleased with my new cut/colour and to have found Foster London - needless to say I'll definitely be going back. I came to the salon with a challenging hair change. I wanted to go from Red to Green turns out that is the hardest thing to do in hair colour world. Simon was the lovely genius who made it happen in such a wonderful way. The first salon I have come across that genuinely care about their costumers. the team went above and beyond to make sure I was completely happy with my hair and guess what.... I am as happy as a giddy clam. I will return to them and recommend them to any one wants perfection! kind, professional and alot of fun! Thank you to the Foster Team. I haven't found a hairdresser I wanted to keep coming back to since I moved to London four years ago. I visited Foster London earlier this year and have finally found a hairdresser to commit to. The staff and their skills are fantastic but what makes it lovely is all the little touches - the in-salon dogs, the little millionaire shortbreads you get with a drink, the wallpaper on the ceiling in the hair washing room. Quirky but not pretentious, with excellent service, I'm a huge fan. I actually travel from right over the other side of London to see Josh at FoLo. I chose the salon and Josh based pretty much on the reviews here and I wasn't disappointed. Having had pretty bad hairdressing experiences in London over the years and went in nervous. I wanted a fairly drastic restyle (a heavy fringe cut into my hitherto pretty boring hair) and Josh did a brilliant job - he listened to what I wanted, looked at pictures I had brought in and made great suggestions about how to approach it, shaping etc. Josh is clearly a perfectionist (and a really nice bloke), he was confident but took his time to get it looking absolutely perfect. I absolutely love my new hair - best hair cut ever! 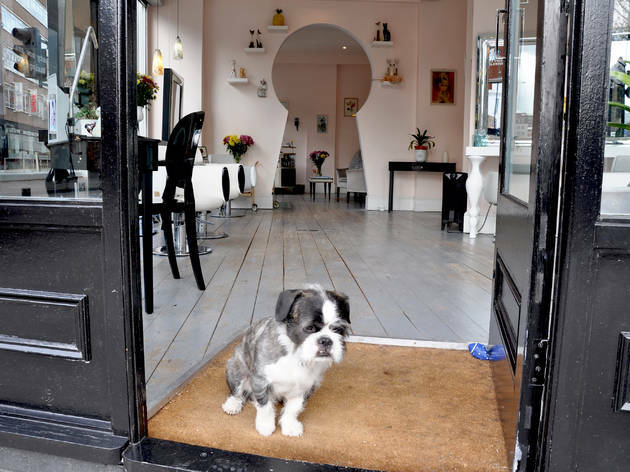 I love the free in-between appointment fringe trims, Ramone the gorgeous resident dog and the free tea and sweets. It is well worth the 75 minute journey! I recently moved to London from Toronto, Canada and found FoLo through the wonderful reviews on Yelp, Qype and TimeOut London. I am completely satisfied with the bleach+toner experience I had with Anna at FoLo. For reference, I have very long (waist-length) black hair but have been bleaching it to very light neutral blonde for 11 years. I usually wait about 10 weeks between root touch-ups so bleaching my hair and making it look even is not the simplest task. It requires a very meticulous colourist/technician, and Anna more than meets this requirement. Before we started, she sat down with me to go over what end result I wanted (golden vs. ashy) and we decided on beige blonde. Then she got to work. I have never seen anyone section hair the way she does to make sure that bleach is applied perfectly on each strand without overlapping previously-bleached parts. She must have quadruple-checked my hair and triple-reapplied bleach to remove the stubborn red undertones. I was absolutely amazed by her patience and talent. Next came the toner. I'm a big fan of Redken Shades EQ toner because it's gentle enough on just bleached scalp. Sadly, FoLo doesn't use Redken. Anna used a Schwarzkopf toner with a bit of peroxide in it, and my scalp felt like it was on fire. She could see that I was in a lot of pain and loosened the hair near my scalp to make it feel better. When the toner finally rinsed off, the colour looked fantastic!!! Perfectly even light beige blonde. The pain during the toning was definitely worth it. Overall, I am very happy with Anna and the team at FoLo, who shampooed and conditioned my hair, as well as offering me beverages and sweets. I highly recommend this salon. Hands down the best haircut in London. Talented, confident, friendly staff - who get it right every time and offer honest advice about cuts and colours - and they are always right.. I have been coming here since it opened and I wouldn't go anywhere else. I lived in Paris for a year - and I still wouldn't stray to another cutter. I fitted my visits back to London in around my need for a visit to Foster London. Do it. Love Foster London. I have spent the last 4 years trying to find a salon where the hairdressers actually listen to you - and I have found it. 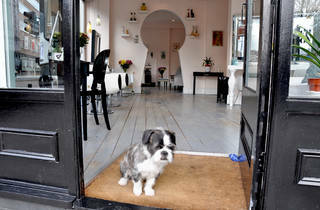 A really nice and chilled atmosphere, everyone is really friendly and they have the coolest dog in the world. It is just by Shoreditch High St Overground Station, so really accessible. I have had my hair cut by a couple of people at Foster and have loved the results every time. Josh has certainly sorted out my unruly mop. I would recommend Foster and Josh to any of my friends with confidence. Thank you Foster London. I've lived in East London for a while now and FoLo is by far the best hairdressers I've been to. The staff are friendly and very helpful and I always leave feeling like it's been money well spent. I usually see Anna, she is the only hairdresser I've ever been to that knows how to deal with fine hair. I always recommend FoLo to friends and everyone loves it. They give great advice but also listen to what you want, which most hairdressers I've been to fail to do. Having been to this salon just once, I already know I've found my new regular hairdresser! Very happy with the friendly service! I recently moved to London and was in search for a new hair stylist. A friend recommended Foster London so I called them up and booked an appointment. I absolutely adored the salon. Very trendy and cozy feeling. All of the staff members were super friendly and went above and beyond what I expect from a hair salon. Josh, Senior Stylist, did exactly what I asked for (Inverted Bob) with much precision. He is a perfectionist and sure not to let anyone down if you go to him. I highly recommend this salon to anyone and I am glad that I have found a stylist in my new home town! My entire life, before I found Foster, was just a dress rehearsal, a pantomime, a fraud. Now I'm the Tad I was born to be, thanks to my amazing hair and the confidence it gives me to chat to girls on the street. I never had the nerve to send food back in restaurants before, but now I never eat an overcooked steak or badly mashed potato. Thanks Foster, and Josh in particular, for giving me a whole new life. Had the most amazing haircut from Matilda today. She got it spot on. FoLo never lets me down. 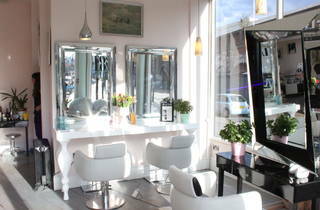 Best salon in East London by a country mile!! Lovely place, very friendly, great value. My first experience was with Lena last year and it was great. I got exactly haircut i wanted, maybe even better. Since then I visit her every month or two. Very satisfied! You enter, get sat down in a chair, read some book on the World´s ugliest haircuts, then somebody takes you downstairs and washes your hair. Upstairs for a cup of tea and lovely cake. You watch yourself transform in the mirror. Of, the cut your hair as well! Have been to Josh twice now, great guy and great at cutting my hair! Going back tomorrow! 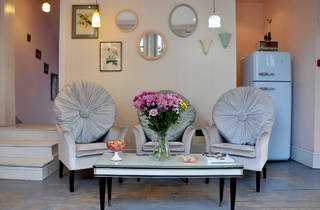 Such a great place, lovely salon with a friendly atmosphere. Had my hair cut here last month by Josh. He sat down and listened to all my thoughts and worries about finding the right haircut that suited me, and was easy to manage. I have never been so happy with a hair cut before, and have been very pleased with the results. Looking forward to going back for my second appointment. I Highly recommend Foster London! Having rather unruly curly hair, I've always struggled to find a decent hairdresser. I've had people too scared to cut, been forced into strange hair drying positions and sat patiently while yet another hair dresser explains that my new 'do' will look so much better after washing. Not so with Foster London. Think I first paid them a year or so ago and now wouldn't go anywhere else. Josh listens to what I want, makes suggestions and confidently delivers a cut that is stylish, lasts and is wearable straight from the salon. Friendly without being fake, I can even cope with a hungover Sunday visit. Highly recommend. What a lovely place! 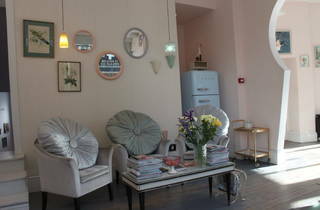 Besides the pretty pastels interior and the genuinely friendly atmosphere, the stylists and customer service is amazing. I had Lena both times I went there (I chose her on purpose the second time because she was great and attentive the first). I must say I've never been treated so well: she listen to your requests as well as guiding you towards what's best for your hair and colour. I went there for a dip dye kind of style but I was afraid of going to blond in the ends (I'm chocolate brown naturally) but the technic she used was perfect, slow enough to avoid damaging the hair but effective. I highly recommend her, beside being really professional, she is really helpful with tips for taking care of the hair and styling. Definitely going back! What a brilliant salon! I went back today for my second visit and Claire turned my blonde hair into a gorgeous auburn shade. Amazing stylists (I had Claire, Josh and Katie) and excellent customer service (I recommend a manicure while you're having your hair done). Top marks! 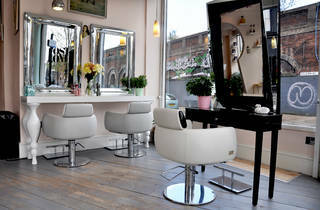 I have been a customer at the majority of the salons in the Shoreditch area over the last few years. I came across Foster London by chance shortly after it opened in 2010 and I consider it to be the best. Everyone I have recommended the salon to has received nothing other than a first class service. Nadia's coloring expertise are second to none and attention to detail and customer satisfaction are unrivaled. I tried Foster London this week, after fancying a change of look I decided to go for a new fringe which my stylist Lina helped create. I have to say it was a fab experience, Lina was very attentive, clear and gave me great assurance that the new look would suit me and was very honest throughout. I was really pleased with the results! 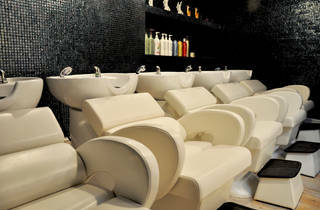 The salon has great decor, a lively environment and everyone is really friendly. I enjoyed it so much I'm booking a full colour this weekend! Check it out if you fancy a professional, enjoyable salon experience! I have to admit, I arrived at Foster London with something of a hairdresser phobia. It had been 18 months since I'd last dared to get my hair cut and I was dreading that all-too-familiar experience of feeling let down by a haircut. It's now two weeks since I had my hair cut by the wonderful Nadia, and not only is it hands down the best haircut I've ever walked out of a salon with, but, by my own 'dreadful-with-my-own-hair' standards, I have been able to make it look just as fantastic on a daily basis as it did leaving the salon those two weeks ago. Nadia listened to everything I told her; she was friendly and professional and showed me loads of simple tips for how to get the best out of the haircut when I was styling it myself - these have proved very useful. The salon is wonderfully and imaginatively decorated and the staff are welcoming and helpful (particular shout out to Ramone). 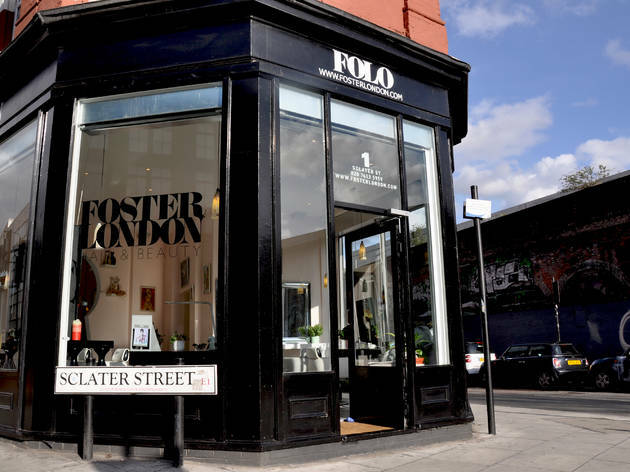 I'm happy to say I've finally found a hairdresser I'm actually looking forward to going back to - thank you Foster London. Finally have the colour of my dreams! Had a great Saturday afternoon at Fosters relaxing salon, people watching and chocolate brownies. Really happy with my hair cut and colour! Thank you Claire and Josh!